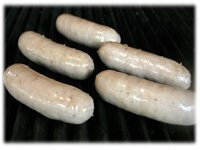 Grilled Sausage is always an easy favorite along side grilled burgers in the summertime. If you don't pay attention though, they can burn or dry out very quickly. 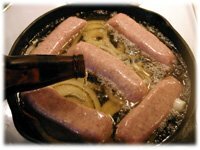 One of the easiest solutions to this, and to guarantee a perfect, juicy grilled sausage everytime is to simmer or pre-cook them in this beer and onion combination. 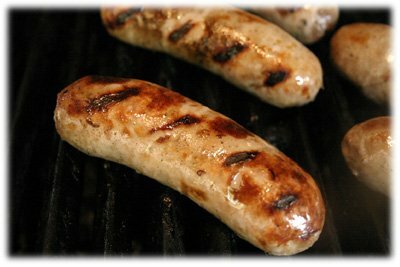 I typically use Bratwurst sausage because I enjoy the flavor and they're not too intense (like spicy Italian) but you can use whatever flavor you enjoy most. And don't worry about overcooking or burning your grilled sausage anymore, there's a couple tips in this recipe that will help prevent that. 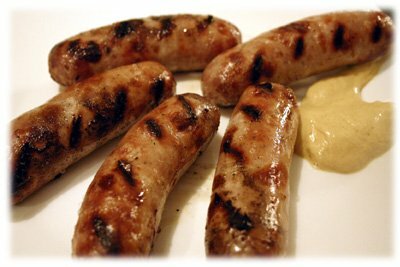 Variation: substitute the Bratwurst for your sausage of choice. 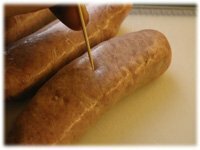 With a toothpick or pin pierce each sausage 6 times. This allows some of the beer/onion flavor to infuse the sausage as they simmer. In the bottom of a frying or simmering pan place sliced onions. I use a cast iron pan with 2" sides. Cover the onions with the sausages. Pour in 3 parts beer and 1 part water until sausages and onions are covered. Simmer on a low boil for 4 - 5 minutes. This partially cooks the sausage which decreases time needed to be grilled. This also helps prevent flare-ups on the grill. Drain the sausages on paper towels or in a colander. Clean and oil the grates of the BBQ. Preheat grill to 475F - 500F. Rub the sausages lightly with oil and place on the grill at an angle to the grates to give a nice grilling pattern on the sausages. After 4 - 6 minutes lift the lid and if the sausage is browning nicely then roll the sausage over to cook it's opposite side. After another 4 - 6 minutes lift the lid and remove the sausages to a warming tray.